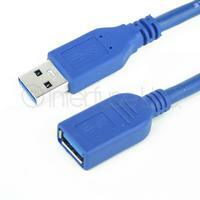 USB Extension Cables can be used to extend the reach of most USB compatible devices. This can include such peripherals as external hard drives, external CD and DVD drives, printers, mice, keyboards, smartphones, tablets and just about anything else that plugs into a computer or laptop. The maximum range of USB is about 16.4 feet or 5 meters. Any longer distance and you may have trouble transmitting data.